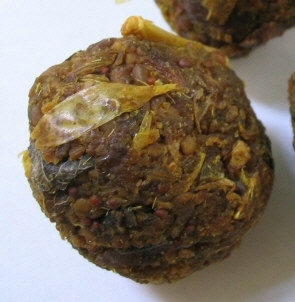 Vadavam or Vadagam or Thalippu Vadagam are balls made of onion and garlic and dals. These are used while seasoning. Finely chop the onions and garlic to fine pieces. Coarsely grind all the dals coarsely. Mix dals, chopped onions and garlic together and dry in sun for about 3 days. Grease your palm with oil and make lemon sized balls from the mixture and dry them again in the sun for about 2 weeks or till the balls become harder.